Here is our second essay in Aeon.com. The title of the essay is: A ‘humanely’ killed animal is still killed – and that’s wrong. We hope that you enjoy it and that it stimulates your thinking about the issue of the interest that animals have in continuing to live–apart from their interest in not suffering. Our first Aeon essay was about domestication and “pet” ownership. In an essay written for this page, Dr. Yamini Narayanan, Senior Lecturer in International and Community Development at Deakin University, Melbourne, explains how Swami Sivarama has misinterpreted Hindu doctrine in his promotion of “Ahimsa milk.” The posting of this essay does not imply agreement with the views of the author as a general matter. The exceptional fetishisation of the fecund, lactating mother cow in India’s dairying sector has, much like the insidious animal agriculture industry itself, woven itself into fabric of cultural and commercial life in India. The image of the butter-loving young boy-god Krishna, and the giving mother cow who diverts her lactation for her “human progeny”, is exploited by both commercial dairy interests and religious gaushalas, to promote the idea of cow milk as ahimsa and love. The name of the nation’s watershed dairy development program, Operation Flood, invokes the imagery of the great legend of the Churning of the Ocean of Milk, wherein a prosperous, white-skinned/milk-white upper-caste Hindu nation will flourish thanks to a milk surplus. “Mother Dairy”, a commercial enterprise to sell cow-based dairy products, is one of the landmark initiatives of Operation Flood, and owned by the National Dairy Development Board of India. A perfunctory Google image search shows that images of the young Krishna stealing butter are widely mobilised in dairy advertisements and logos. Dairies commonly bear the name of Krishna – Sri Krishna dairy, Sri Krishna Ghee and the Chennai-based conglomerate Sri Krishna Sweets to name just a few. 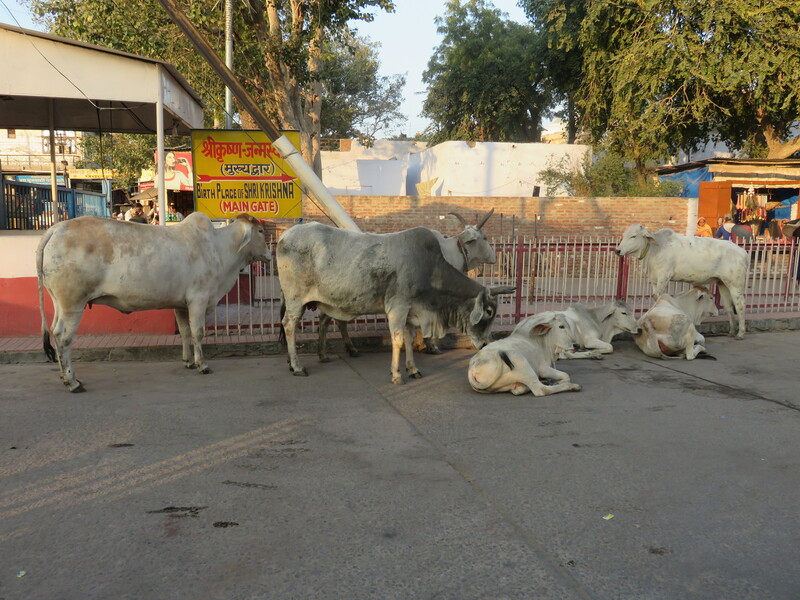 Photo: Abandoned male cattle of all ages can be seen throughout public spaces in Mathura, indicating the prolific breeding for dairying in the hundreds of gaushalas throughout the city. Hinduism is rendered a vital resource to commercialise the cow, particularly through the popular Krishna tales. 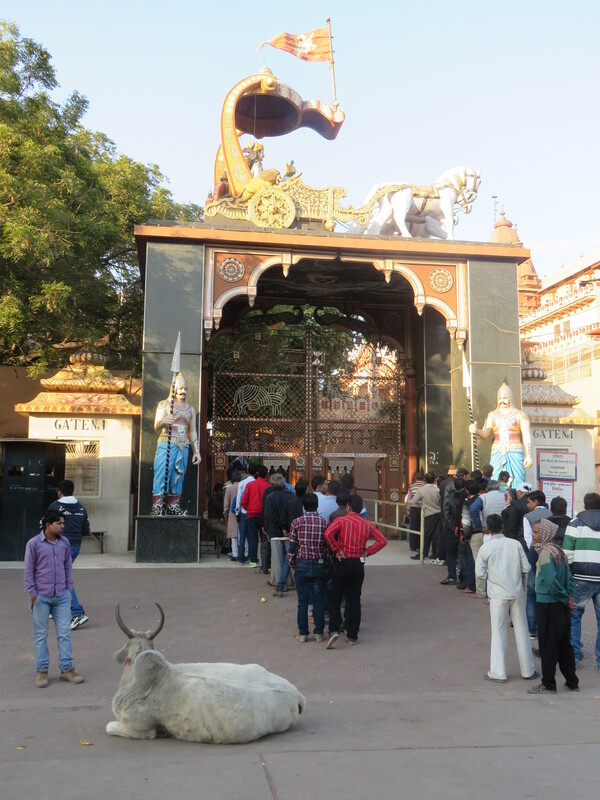 The devotees of Krishna – Vaishnavites – constitute the largest sect in India. During my three-year research into cow protectionism in India, I would repeatedly encounter temple priests and officials from ISKCON and other Krishna temples who would stridently resist the suggestion that consumption of cow milk constitutes profuse violence to the cows. Hungarian Hare Krishna devotee Sivarama Swami describes himself as a “veggie-vegan” fundamentally because, as he says, “I can’t give up milk products”. 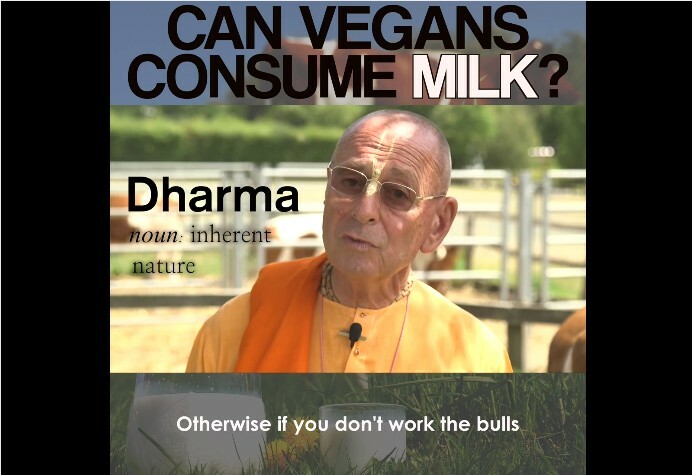 He resorts to quoting truisms to present milk sourced from Hare Krishna farms as “ahimsa” and obscure the violence to cows in which they are complicit, in the very name of cow protection. However, even aside from the ethical problems of animal farming, two key Hindu legends make clear that regardless of where and how the cow was “farmed”, the notion of “ahimsa milk” is fundamentally impossible as a matter of Hindu doctrine. Photo: An abandoned old bull waits for sweets from devotees outside the Sri Krishna Janmasthan temple, the birthplace of Lord Krishna. Krishna’s birth story reveals an extraordinary silence about his birth-mother, and there are vital unremarked similarities between the child-god Krishna, and the modern-day male calves in commercial dairies. In a striking parallel to dairy calves in modern factory farms, Krishna was born in prison, and was separated from his own incarcerated biological mother minutes after birth, prior to even receiving his first lactation. Krishna was lovingly raised by his adoptive human mother Yashodha – and the cows. The stories of Krishna celebrate lactation stories from his non-biological mothers, altogether ignoring any inconvenient reference to the anxiety and suffering of his biological mother, or indeed, potentially his own primordial ones, at the separation of child from mother. Akin to the eulogisation of Krishna’s lactation from non-biological mothers, the tendency of humans as a species, and particularly in the case of Hindus, is to similarly celebrate the breast milk from cows who are designated their “mothers”. The wide significance of the cow and her milk in Hindu scriptures, and use of the cow’s milk for human consumption establishes – problematically – the cow as the mother of Hindus. The scriptures do selectively recognise the commercialisation of infant lactation as unethical because making it profitable immediately means violence for mother and child from whom the calf will be removed. Madhava in the Parashara (2.7) advises, “A Brahman should not sell such things as sesame or ghee, milk, or honey.” However, India’s dairy policies, which prolifically borrow from the milk mythologies of Hinduism as a commercialisation strategy, ignore the latent violence in the commodification of milk – as noted explicitly in the scriptures. Crucially, the emotive symbolism of the Mother Cow and her outpouring of milk, serves a strategic nation-building narrative of an upper-caste Hindu Mother India. Indian feminists have long criticised the motherhood metaphor as deeply oppressive for women; Vanaja Dhruvarajan charges the eulogisation of Hindu women as ideal mother (and wife) as an oppressive strategy to keep feminised bodies in place, and as almost singularly responsible for their backward status. (1) Likewise, the exaltation of bovine bodies imposes on them the burden of maintaining an exceptionally patriarchal brand of ‘Hindu purity’. Cows, however, find themselves doubly oppressed as species, and symbols of patriarchal Hindu nationalism. 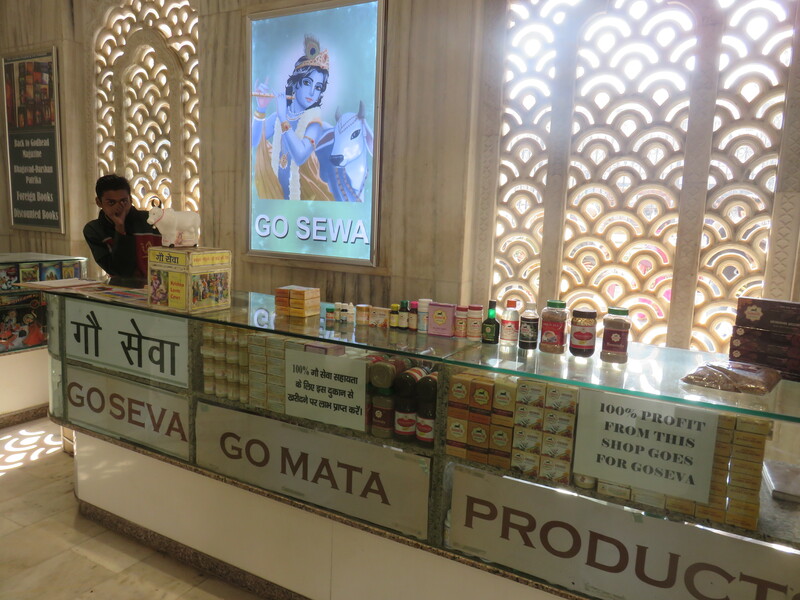 Photo: The Gauseva shop at the ISKCON temple in Mathura where the sale of dairy products is actively promoted as a cow protection activity. 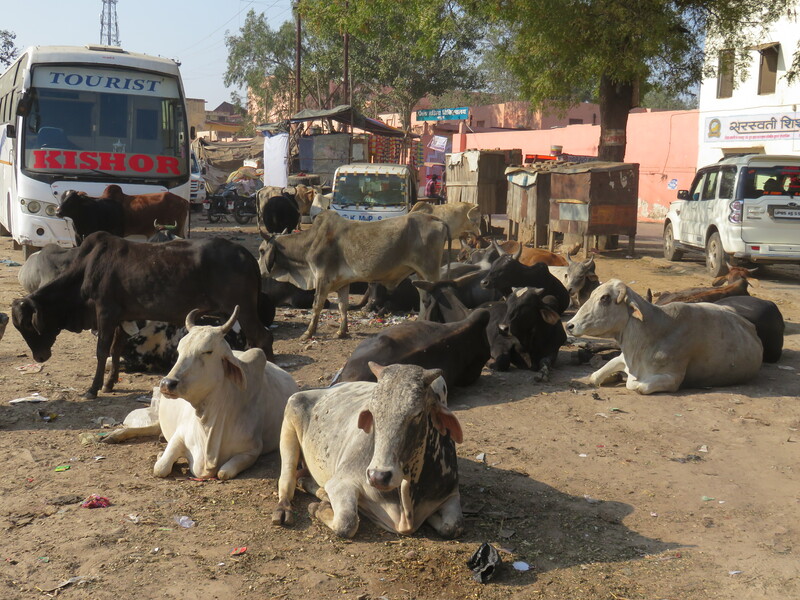 Photo: Dairy cows and their calves from a nearby gaushala forage for food near the Sri Janmashtan temple. In the last epoch – the current Kali Yuga –the cow most suffers as a result of human delusions, and erosion of the truth. In this Dark Age, the greatest deceptions come, ironically and grievously, from self-stated protectors of the cow. The criminalising of beef, a by-product of the dairy sector in India, as responsible for cow slaughter, advances the rhetoric of the cow-killing Muslims, and tactically frames beef as a Muslim product. In contrast, the “spiritually pure”, nourishing milk of native Indian breed cows is implicitly Hindu milk. 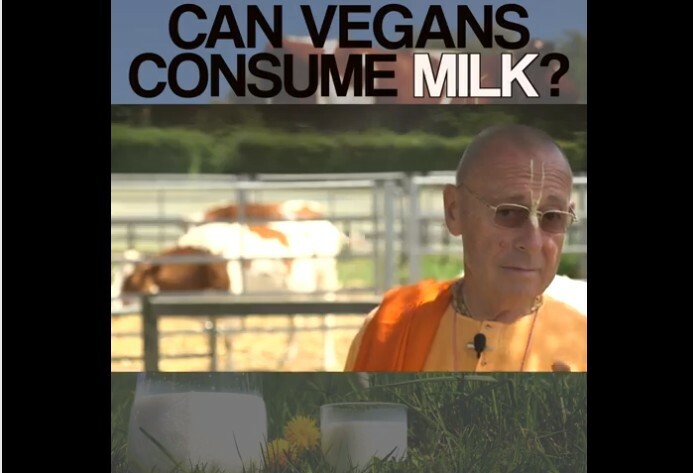 In the light of Hinduism’s own sombre predictions about human delusion in the Kali Yuga, it would behove leaders like Swami Sivarama to reflect deeply and humbly on the traumas experienced by dairy animals globally. To preserve Hinduism’s spirit of scientific inquiry, platitudes about ahimsa milk must be analysed against the mounting evidence of the violence to dairy cows through genetic interbreeding to escalate milk production, and the moral arguments of veganism that Swami Sivarama currently and inexplicably rejects. Otherwise in an unfortunate and willful malapropism, the Hare Krishnas, and Hindu sects more broadly, will be part of reinforcing a purely profit and greed-oriented industry narrative that views cows as a sacred resource, rather than cows and all animals as intrinsically sacred and valuable. 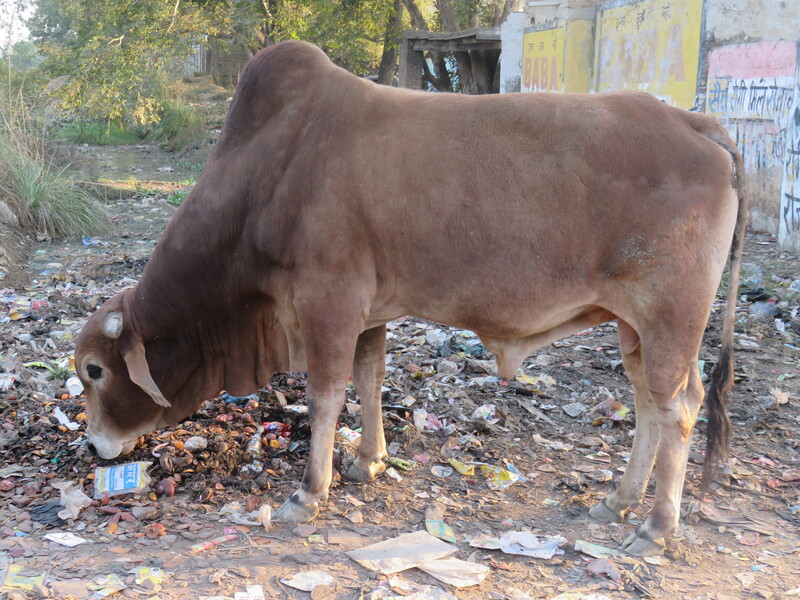 Photo: A magnificent abandoned Gir breed bull forages among the city’s waste. (1) Dhruvarajan, Vanaja. 1990. Religious Ideology, Hindu Women, and Development in India. Journal of Social Issues 46 (3): 57-70. (2) Daniélou, Alain. (1991). The Myths and Gods of India. Inner Traditions International, Rochester. (3) Doniger, Wendy. (1976). The Origins of Evil in Hindu Mythology. Berkeley: University of California Press. (4) Sankaran, C. (2014). Problems with feminine empowerment in goddess films: A feminist analysis of South Indian goddess films. Studies in South Asian Film & Media, 6(1), 3-22.